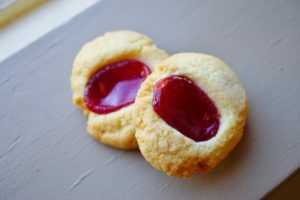 THUMBPRINT COOKIES – A Gluten Free Treat for the Family! In a medium bowl, stir together the almond flour, coconut flour, sugar, baking powder and salt. In another medium bowl, stir together the coconut oil, egg and almond extract. Add the flour mixture to the wet mixture and stir just until combined. The dough will feel quite wet. Let sit for 10 minutes, which allows the coconut flour to absorb the liquid. Preheat the oven to 350 °F and line a cookie sheet with a piece of parchment paper. Roll the dough into 1″ balls and place 2″ apart on the prepared cookie sheet. The dough will feel quite greasy but this is okay. Using your thumb, make an indentation about 3/4 of the way down into each cookie. You may want to re-form the edges a little to make them prettier. Fill each indentation with 1/2 teaspoon of jam. Be sure not to overfill them. Bake for 8 minutes or until the cookies have barely started browning on the bottom. Let the cookies, which will be very soft, cool for 5 minutes on the baking sheet and then remove to a wire rack to cool completely. Pipe with white chocolate, if desired. Refrigerate in an airtight container for up to 4 days.